3rd. Movement - Theme and Variations on "Pria ch'io l'impegno"
Reproduction Walter 5 1/2 octave fortepiano by Paul McNulty. Beethoven Sonata in C# minor - "Moonlight"
Live recital at Queens College, NY, October 2007. Reproduction Walter by Rod Regier. Live recital, Salon/Sanctuary series at Abigail Adams Smith Auditorium, NYC, 2010. 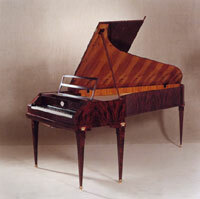 Reproduction Walter 5 1/2 octave fortepiano by Paul McNulty. Coming soon, video of piano trios by Beethoven and Brahms with Romie de Guise-Langlois, clarinet and Fred Sherry, cello.